Ocean Craft Marine Produces Fast Action YouTube® Video Featuring Our Boats Underway in High-Action! Annapolis, MD.,Ocean Craft Marine (OCM) produced and went viral with a new, fast-action video on YouTube®. 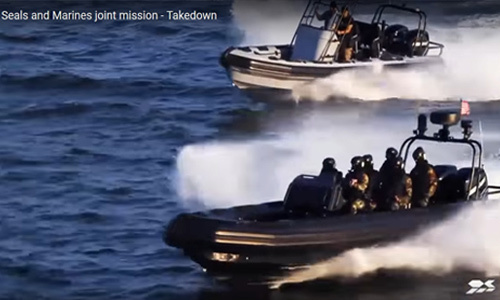 Just uploaded to the new Ocean Craft Marine YouTube® Channel, is a fast-pace, high-action video featuring some of OCM’s best military and law enforcement RHIBs. Stay tuned to the Ocean Craft Marine YouTube® Channel (http://www.youtube.com/user/OceanCraftMarineUSA ) for future videos featuring our finest products in action. Twenty New OCM 8.0 LE Boats Recently Delivered and Ready for Duty! Ocean Craft Marine just recently delivered twenty of the newest model OCM 8.0 Law Enforcement RHIBs. The OCM 8.0 LE is powered by twin Mercury Verado™ 200 HP outboard motors and has a top speed of 57 Mph. The 8.0LE, offered as a “turn-key” solution, incorporates a custom seating solution designed to provide our maritime law enforcement operators the greatest level of comfort, safety and versatility. “…These articulating seats allow marine police officers three different seating solutions in one very clean versatile package,” said Todd Salus Ocean Craft Marine Vice President of Sales and Marketing. “…In just seconds, and while underway, officers can articulate the seating positions to operate the vessel from either a fully-seated position, a leaning and semi-bolstered position, or a fully-standing, fully-bolstered position as the prevailing conditions and patrol environments may necessitate,” continued Salus. “…Maritime law enforcement officers need to know that our OCM 8.0 LE is designed and constructed to meet the same exacting, rugged standards as our military boats, far beyond that of most commercially available RHIBS,” said Todd Salus. Whether your department’s need is fishery enforcement, harbor security and enforcement patrols or tactical team interdiction the OCM 8.0LE has the mission covered. Three NEW Military, Ocean Craft Marine 8.0 Meter RHIBS with Inboard Diesel Stern Drive Engines Delivered to a Private Security Firm.